Developed in conjunction with Wicomico County Schools. Poetry is a special kind of writing that uses the sound and rhythm of words to tell a story and to make the reader feel a certain way. These feelings are created through setting, mood, and tone. Setting is the time and place a story or poem takes place in. Mood and tone have to do with how the poem makes you feel. It could be a funny, silly poem or a dark, sad one. Sometimes, poems rhyme, but sometimes they don’t. Sometimes, poems follow specific rules, like how many words are in each line, but not always. Some poems have several stanzas or sections, and other don't. Some poems have a specific number of syllables in each line, but some poems have no rules at all. One of the best things about poetry is that there are so many kinds of poems. You can choose the type that works best for what you are writing about and how you feel. You can even create your own kind of poem. Here are some different types of poems with examples of each one. Alphabet poems have 26 lines, each beginning with a different letter of the alphabet. They are written about one theme. Sometimes they rhyme, but they don’t have to. A cinquain is a five-line poem (like “cinco” for five in Spanish). The first line is one word, usually a noun, which is the main subject of the poem. The second line contains two adjectives that describe the topic. The third line has three verbs that relate to the topic. The fourth line has four words that can be a phrase or sentence telling something about the topic. The fifth line is a single word that is another word for the topic. A diamante is similar to a cinquain, but it has seven lines. Diamante poems have the shape of a diamond. The first line is one noun. The second line is two adjectives. The third line has three participles (-ing verbs). The fourth line has four nouns. Then the pattern repeats the opposite direction. The fifth line has three participles (-ing verbs). The sixth line has two adjectives. The seventh line has one noun. A definition poem defines something using metaphors or imagery. This is special language that paints a picture for the reader. It is much more interesting than a regular dictionary definition. Definition poems generally use free verse (which means that they have no regular rules for rhythm or meter). A catalog poem is a list of things. It can be any length and may rhyme or not. An acrostic poem is a poem that is written around a word. The first letter of each line spells out that word. A limerick is a silly or humorous poem that follows a specific pattern. Lines 1, 2, and 5 are longer and rhyme with each other. Lines 3 and 4 are shorter and rhyme with each other. A quatrain is a four-line poem that rhymes. (“Quatro” means four in Spanish.) Each line is about the same length. The rhyming pattern may be that lines 1 and 2 rhyme and lines 3 and 4 rhyme. Or lines 1 and 3 and lines 2 and 4 may rhyme. Haiku poetry comes from Japan. Haiku poems have three lines. They follow very specific rules. The first line has five syllables, the second line has seven syllables, and the third line has five syllables. Haiku poems do not rhyme. Often, the topic is related to nature or the seasons. A concrete poem is written in the actual shape of the subject of the poem. Here is a concrete poem. You can tell what it is about without even reading it! A poem for two voices is written for two people to perform. Often, it is written in two columns with each person’s part in a column. Here is a poem for two voices. Try reading it aloud with someone. Here are some activities to try on your own. 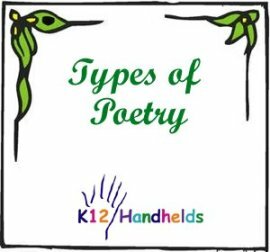 Choose two types of poems and compare and contrast them. How are they similar? How are they different? Which do you like better? Why? For each of the following topics, which type of poem might be most appropriate? 3. Choose a type of poem and write your own poem in that format. 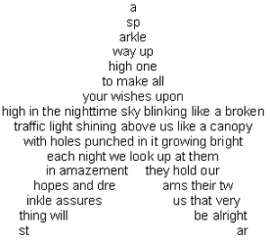 concrete poem – a poem that is written in the physical shape of the subject. metaphor – a figure of speech that states two unlike things are the same in a figurative way (without using “like” or “as”); example: She was the wind. simile – a figure of speech comparing two unlike things using “like” or “as”; example: She was as fast as the wind.